This entry was posted in 10 Commandments and tagged 10 Commandments, resolutions on July 21, 2010 by Tim Archer. I had hoped for a bit more discussion yesterday, especially with suggestions on how to decide if a nation is Christian or not. I appreciated Jon’s addition of “the DNA of a culture,” though I wish we could have fleshed out a bit just what that looks like. One common argument that I think has to be rejected is about laws being based on the 10 Commandments. Have you read the 10 Commandments lately? If not, take a moment, turn to Exodus 20, read them, then come back here. 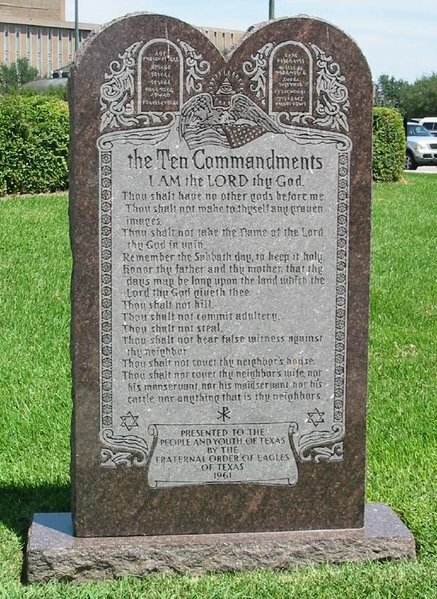 There have been societies that tried to enforce most if not all of the 10 Commandments. I don’t think there is a modern society that does so. Laws about coveting? Honoring parents? Not taking the Lord’s Name in vain? Not that I can tell. Graven images? Polytheism? Keeping the Sabbath? We’ve just knocked out 6 of the 10, for those of you keeping score at home. A few places still have adultery laws, though I wonder when was the last time someone was prosecuted for adultery (here in the States). That leaves us murder, theft, and perjury. Things which just about every culture forbids, be they Christian, Buddhist or otherwise. We can say that we punish those things because of our respect for the 10 Commandments, but that would be a hard case to prove. I don’t doubt that many legislators and jurists respect the 10 Commandments. But to affirm that a modern legal system is somehow based on them is a distortion of the truth. This entry was posted in 10 Commandments, Christian nation and tagged 10 Commandments, Christian nation on October 20, 2009 by Tim Archer.